It’s a battle of Chicken and the Egg in this week’s episode of The Living Room. Mother of three Rebecca’s attempts at DYI have ended in disaster. Her attempts to revamp the family room have left her walls in ruin and in dire need of repair. Barry Du Bois gives Bec the DIY skills she needs to rezone her family area and create a new room for the whole family to use. Have you dreamt about having fresh eggs every morning? Dr Chris Brown has all the info you need to raise healthy, happy chooks with the best eggs every time. Miguel meets Bec Scott, CEO of STREAT, a social enterprise helping young people in need, and Davis, who’s a graduate of the course. 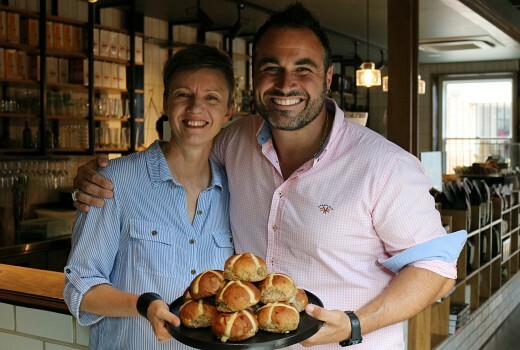 Inspired by STREAT’s signature ‘Buns of Steel’ Hot Cross Buns, Miguel recreates a Spanish version of the Easter crowd pleaser, that’s a mix of sweet and savoury, with a whole egg in the centre. Trezone? Are the PR types at TEN just making up words now? Ok so they made an error and I turned it into another.